This product gives tips and suggestions for every step of the recruiting process and provides forms and job descriptions that help make recruiting easy. It's easily used in planning recruitment strategies as well as a quick resource for ideas. Also included is a CD-ROM to help churches customize each resource. - Publisher This product gives tips and suggestions for every step of the recruiting process and provides forms and job descriptions that help make recruiting easy. It's easily used in planning recruitment strategies as well as a quick resource for ideas. Also included is a CD-ROM to help churches customize each resource. 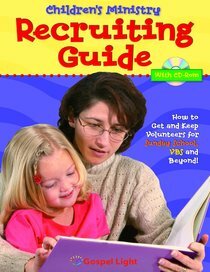 About "Children's Ministry Recruiting Guide With CDROM"